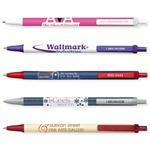 Custom Bic Round Stic Pens with your promotional logo by Adco Marketing. Build your own color combination of barrel and caps. Just ask Adco Marketing for help with the artwork. 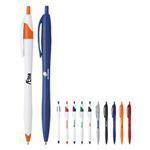 Call 888-332-ADCO - we'll do a free mockup of your info on the pen and help you through the order process. Imprint Area: 2 1/2” x 3/4”. 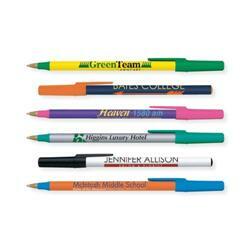 Available Imprint Options: Second color add $0.12 per pen. 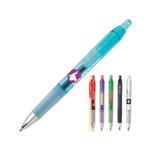 Point Style/Ink Color: Standard is medium point Black. 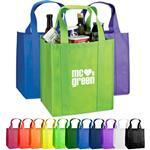 On request, blue, red or purple ink available. 6 lbs. (approx) @ 500 per carton.